Do you enjoy reading? We read critically acclaimed nonfiction old and new. All readers welcome. For additional information, please call 215- 685-1633. Written in 1930 and published in 1931, Allen, longtime Editor-in -Chief of Harper’s Magazine and a renowned American historian specializing in recent and popular history, gives a witty, yet unsentimental account of everything that made the 1920's in America such a decade of upheaval: the changing social mores, political movements, rich vs. poor elements, race relations and, Prohibition, Al Capone, the President Harding scandals, the first radio, the revolution of manners and morals, the scandalous rise of skirt hemlines, Black Tuesday. Only Yesterday, enormously successful at the time, was hailed as an instant classic, and was followed, ten years later, by the equally insightful, and equally successful, Since Yesterday: the 1930’s in America, September 3, 1929 -September 3, 1939. 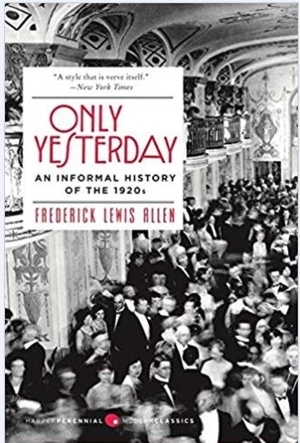 Allen’s prose style, considered unique for an historian of the time, is both delightful and insightful, as it weaves together the events of the day into a story that shows cause and effect. Additionally, Allen had a tremendous knack for picking out details that would reverberate for decades to come, and, in a great many instances, still be relevant almost 100 years later.